The new Soko Bamboo range at Furniture 123 offers the best of both worlds. Not only is this range undeniably stylish, with a choice of two delicious finishes, aptly named caramel and chocolate, and an Orient inspired boutique look; it is also undoubtedly ethical. These 11 stunning pieces of ‘Eco-Luxury’ furniture are produced by a carbon neutral supplier and made from the world’s most sustainable plant: bamboo. They feature low VOC paint finishes and use water based lacquers. So now you really can help save the Earth, one piece of furniture at a time. 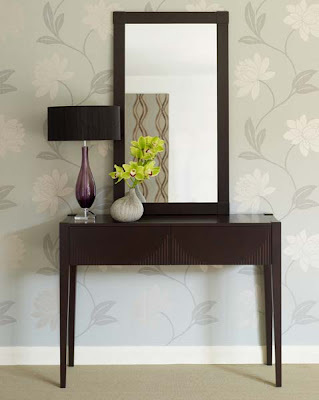 Shown here in chocolate, this stunning vanity set comprises a large dressing table with two drawers and even larger mirror that can be hung in portrait (as above) or landscape orientation. The refined lines of these classic looking pieces are accentuated by the bevelled corner and subtle ribbed details on the drawer fronts, which draw their inspiration from the Far East. If you want to bring some Boutique hotel chic to your bedroom the Soko Bamboo Bedroom Sets (available in 3 and 4 pieces) are the perfect place to start. The stunningly tall Soko Bamboo Headboard, shown here in caramel, with it’s sunrise motif and ivory leather pads will instantly update a tired divan bed. The bedside table is equally tall and elegant. 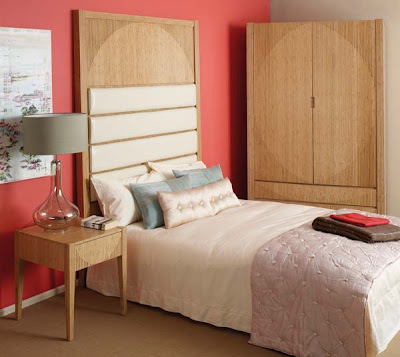 Then choose from a wardrobe (as shown above) or a dressing table with mirror. This striking chest is available in caramel, as shown, or chocolate. 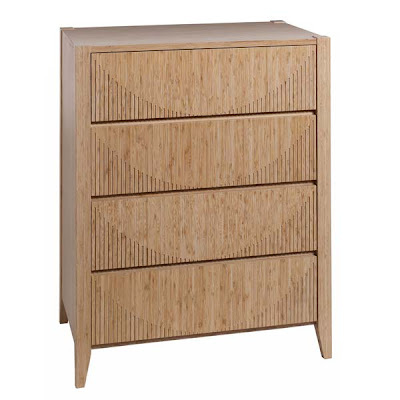 The graduated ribbing on the front of the 4 drawers contrasts with the sleek silhouette, while the natural bamboo material lends a warm, organic feel to the piece. This is the perfect way to bring some Eastern luxury into your bedroom. Pin It Now!